Though this website is less than three weeks old, today marks the two month anniversary of the New Order of Highsec. On June 24, I went to EVE-O and declared that I was taking over Halaima and establishing a new government there. (This and other threads can be accessed via the Links page.) And what a two months it has been. It seems like a lifetime ago! In the week prior to the June 24th declaration, I had been engaged in a series of exchanges with the GM who had given me a warning for what was viewed as a senseless bumping of random miners. EVE's rules on bumping are very complicated, and the GM offered a list of different situations in which bumping was viewed as acceptable. After reading the what the GM wrote about the rules, I decided that I would not bump miners anymore because I did not want to enter any "gray areas". I have too much respect for the EULA of EVE and for those who enforce it. I retired for the evening, unsure if I would even continue playing EVE. But that very night, I awoke from a marvelous dream. In the dream, I saw myself standing astride highsec like a colossus, bringing order, wisdom, and happiness to the miners. When I woke, some of the GM's words echoed in my mind. In the list of acceptable bumping practices, he said something about miners bumping their competition out of the belts to keep them from depleting. In an instant, everything came together for me. I immediately leapt to my computer and filed a reply to the GM, sharing some relevant details of my vision and asking if they fit within the rules. Highsec would never be the same again. In the short space of two months, so much has changed. Scores of mining permits sold, nearly a hundred million isk in loot from my fallen enemies, more than eighty investors purchasing over seven and a half billion isk of shares, new bumpers and Agents of the New Order joining by the day and having adventures of their own. I can scarcely keep up with everything that has been happening, but I'll try. The New Order began as a dream, as one man with a stabber bumping some miners in Halaima. They said it was impossible. They said I was a dreamer, and they were right--but I'm not the only one. We are the hope and the future of EVE. No one can stop the New Order. They can only join us, and love us. Highsec is ours. Brb, framing your autographed portrait. 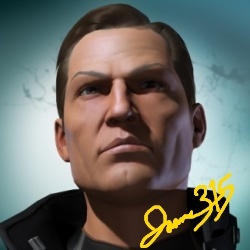 From now on, I'll be able to look next to my PC monitor at your portrait to remind myself that yes, there are still forces for good in the Eve Universe. It will sit gloriously framed above my computer. The word "pretentious" definitely comes to mind, here.